I hadn't been to the American Museum of Natural History in many years, so I was excited to be going. We started in the room with the elephant statues and the animal dioramas. The room was difficult to sketch in because it was so dim. Rayle had a brilliant idea to wear her headlight to illuminate her paper. That seemed to work well so maybe I'll be making a purchase. 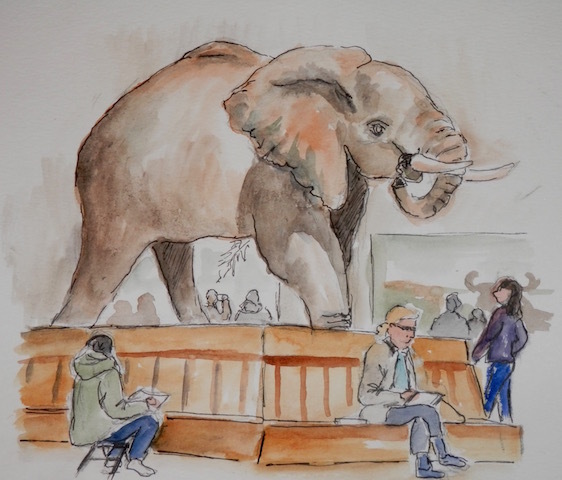 I sketched one of the elephants and a few of our sketchers...Laura on the right and I'm not sure who was on the left. 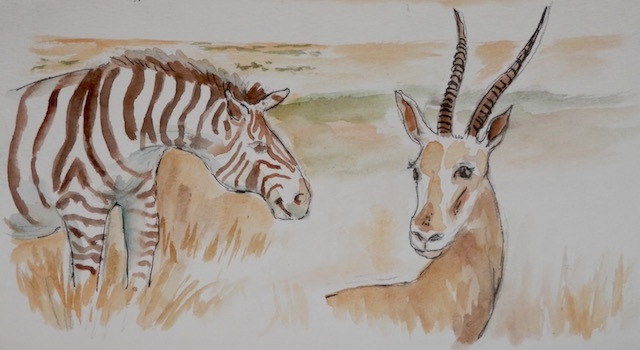 I also sketch a few of the animals in the dioramas. After lunch we headed up to the 4th floor. I just had to go sketch a big dinosaur. I was sketching in a 9 x 12 book and did the right side first before opening it to sketch across to the other side so the tyrannosarus would fit. It was a bit awkward to balance the width of the sketchbook. This was done directly in watercolor...no pencil lines. 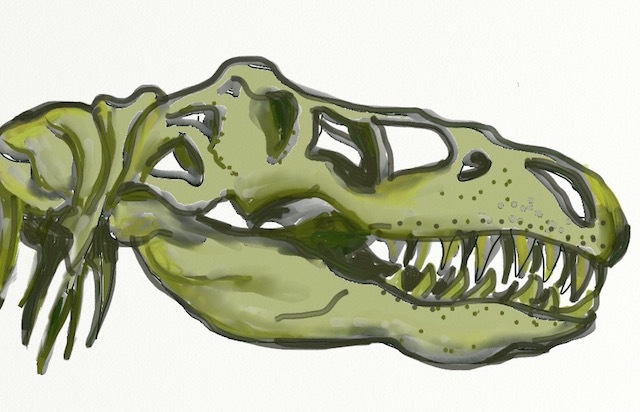 I had a little time to spare before we were meeting downstairs so I did the skull on my iPad in the Artrage program. I am new to digital sketching but have been doing a little practice lately which helped for this sketch. I thought it was a great place to sketch the day away and I hope we return. Impressive work on the dinosaur! I should have brought my extra long sketchbook for you to use! Thanks Shawne! I have a fun time sketching him. Intrigued by the iPad sketch. Have to say that the double page blue and gray dinosaur sketch was absolutely stunning in person. It unfortunately loses a lot of it's impact in the reproduction. You guys should have seen it in person! Thanks so much, Mark. It will take me a lot of practice to figure out how to shade on the iPad. I was really happy with the way the dinosaur came out.